During their lifetime, most ERP systems will face problems with either performance or data quality. These issues can usually be fixed. But in 9 out of 10 cases, the core problem is initially misdiagnosed. So although the issue might appear to be solved, it just pops up again later. This can lead to a lot of expensive trial and error before you find a cure that lasts. But for those who are fortunate enough to have invested in a Dynamics 365 for Finance and Operation solution or a Dynamics AX solution, there is an easier way. ENAVATE System Optimization Suite is a unique combination of healing and preventive IT tools that give you a full diagnosis of your Dynamics installation and help keep your business running strong and healthy – now and in the future. To learn more about each of the solutions, please click on the links below. Health Check Ensure data integrity and application quality and boost system responsiveness. Business Care Monitor the ongoing performance, capacity, and availability of your entire system & infrastructure. Security Kit Faster implementation and administration of user rights and application security. Global Data Management Flexible, consistent management of global master data and parameter settings across your organization. ENAVATE is ready to help you optimize your Dynamics solution! 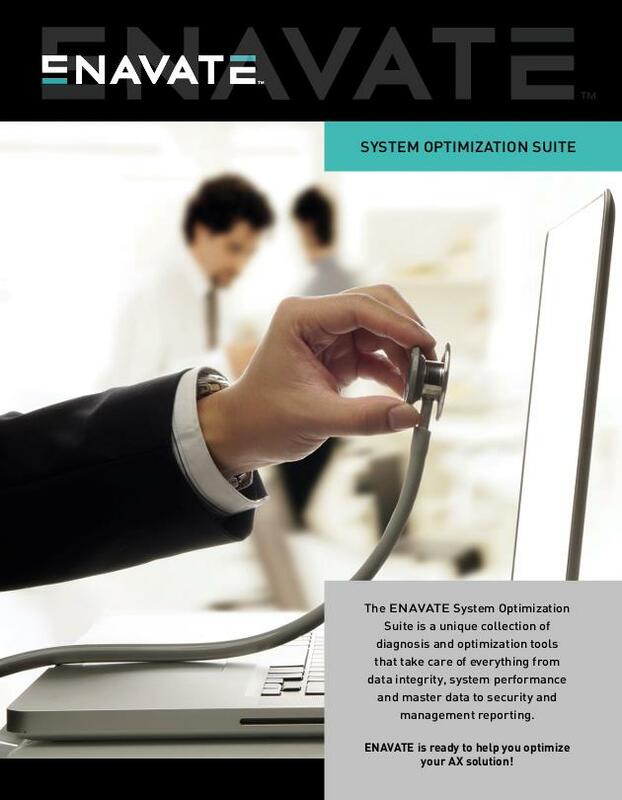 The ENAVATE System Optimization Suite is a unique collection of diagnosis and optimization tools that take care of everything from data integrity, system performance and master data to threats to security and management reporting.